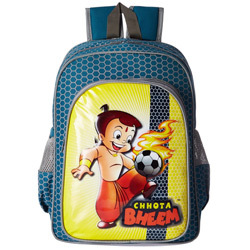 Treat your near and dear ones in an exclusive way with this Remarkable Choice of Chhota Bheem School Bag and make them feel very special. Key features of this Blue Color Bag include Water Resistance, Padded Shoulder Straps and Back Padding for Comfort, 3 Specious Compartments, made of Tough Synthetic Fabric that offers Durability and Two Mesh Pockets. (Dimension-11”/5.5”/14”).